The purpose of Art Schools has been the subject of much questioning and debate in recent months. The exhibition ‘81-18’ offers a response - to bring diverse talents together to react and engage. 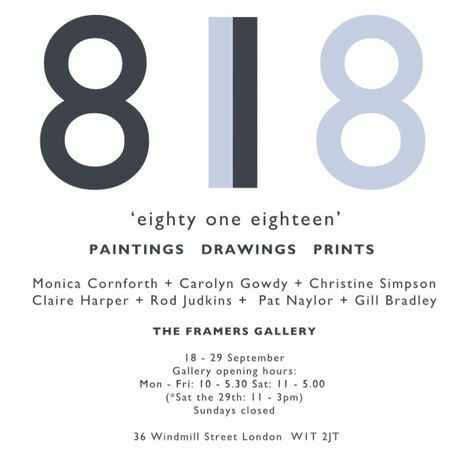 ’81-18’ celebrates the creative connection between seven like-minded artists who kept in touch after leaving the Royal College of Art. The exhibition was suggested by Linda Kitson and sponsored by Quentin Blake; their RCA college tutors. The collective have produced figurative work that captures the energy and natural affinity of the student shows they took part in at the RCA in the early 1980s - hence the title ‘81-18’. After long and distinguished careers as artists, the exhibition is an opportunity to recreate their shared enthusiasm for figurative painting, printmaking and drawing, and a way of saying ‘thank you’ to the tutors who encouraged and inspired them . Monica Cornforth uses figurative drawing as a starting point. By exploring line and colour with a freedom and intensity, her drawings have a painterly feel, bordering on abstraction. Pattern and colour feature prominently in her current work influenced by many years working as an editor on various magazines including Vogue. Carolyn Gowdy born in Seattle, Carolyn has been based in London since 1977. She studied at the University of Washington, Seattle (1972-74), Rhode Island School of Design, Providence (1974-76, BFA), and the Royal College of Art, London (1977-80, MA). Gowdy has worked internationally as an illustrator and is renowned for narrative paintings, drawings, and collages populated by a cast of idiosyncratic characters amidst playful, reflective, and philosophical imagery. She is also a poet and experimental artist.